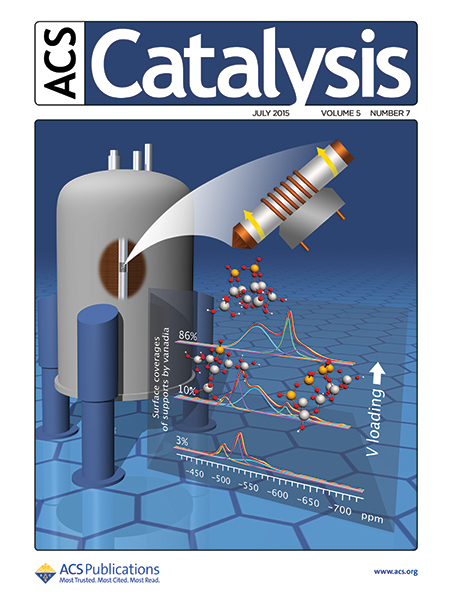 Experimental work with vanadium oxide catalysts relied on sophisticated spectroscopy and chemical structure calculations to establish a relationship between specific sites on the catalysts and the degree of activity they bring out in a reaction. The work was published in the July 2, 2015, issue of ACS Catalysis and featured on the cover. Posted with permission from ACS Catalysis, July 2, 2015, 5(7). Copyright 2015 American Chemical Society. Enlarge Image. Results: If you want to change a situation, it's often best to get to the heart of the matter. For chemists, this often means delving into the active sites of catalysts, which speed the reactions behind billions of dollars worth of chemicals and other products. Active sites are where the reaction actually happens. If active sites work slowly or fail quickly, the result is higher costs and lower production rates. To make better active sites, scientists need to see the sites. For the first time, a team led by researchers at Pacific Northwest National Laboratory saw the active sites on a well-known vanadium-based catalyst. In addition to the PNNL staff, the team included experts from Washington State University, the University of Alabama, and the Dalian Institute of Chemical Physics, Chinese Academy of Sciences. Why It Matters: Fast. Stable. Efficient. These are the hallmarks of a good catalyst, one that can produce needed products without excessive costs or wastes. The results from this study could help researchers design such catalysts. How? By finding ways to create more active sites or protect existing sites from degrading during such reactions -- or both. Methods: In the experiments, the researchers dispersed or spread the vanadium oxide catalyst on a support of titanium dioxide to create a relatively large surface area with more reactive sites. They used a magic angle spinning (MAS) nuclear magnetic resonance (NMR) spectroscopy technology at EMSL, the Department of Energy's Environmental Molecular Sciences Laboratory, to obtain detailed information about the structures of active species as they exist on the titanium dioxide support. "Using an ultra-high magnetic field with fast spinning enabled the team to observe five types of surface vanadium oxide structures that exist when supported on the surfaces of titanium dioxide," said Dr. Jian Zhi Hu, a PNNL scientist and the team's lead. The scientists correlated the various peaks observed in the NMR spectra with the catalysts' reactivity for an oxidation reaction that removes a hydrogen atom from methanol. Next, using computational methods, they predicted which peaks in the NMR spectra corresponded with the specific vanadium oxide geometries. In this way, the scientists determined which structures on the vanadium oxide surface do the best job of initiating and sustaining reactions. What's Next? The research team continues their efforts to study the structure of catalysts and their corresponding catalytic reactions. Their eventual aim is to gain a better understanding of the sites that most effectively bring about chemical reactions important for industrial uses. Sponsors: This research was supported by the U.S. Department of Energy (DOE) Office of Science, Office of Basic Energy Sciences, Division of Chemical Sciences, Geosciences, and Biosciences. User Facility: The NMR experiments were performed at EMSL, a national scientific user facility sponsored by the DOE's Office of Biological and Environmental Research located at Pacific Northwest National Laboratory (PNNL). Computational modeling was carried out using EMSL's supercomputers. Research Team: Jian Zhi Hu, Wei-Zhen Li, Mary Y. Hu, Xuchu Deng, and Charles H.F. Peden, Institute for Integrated Catalysis, PNNL; Yong Wang, Washington State University and Institute for Integrated Catalysis, PNNL; David A. Dixon, Monica Vasiliu, and Raluca Craciun, University of Alabama; Xinhe Bao and Suochang Xu, Dalian Institute of Chemical Physics, Chinese Academy of Sciences. Reference: J. Hu, S Xu, W Li, M Hu, X Deng, Y Wang, C Peden, D Dixon, M Vasiliu, R Craciun, and X Bao. 2015. "Investigation of the Structure and Active Sites of TiO2 Nanorod Supported VOx Catalysts by High-Field and Fast-Spinning 51V MAS NMR." ACS Catalysis April 2015: 3945-3952. DOI: 10.1021/acscatal.5b00286.